Historian Jean-Rae Turner knows plenty about Newark's Gypsies. She discovered them years ago while working on the Evergreen Cemetery nomination for the National Register of Historic Places. In general, we know that Gypsies often are nomadic people found on every continent of earth. While they may live in one location for a short time, they tend to disassociate themselves from the local population or fight assimilation into any one regional culture. Gypsies are believed to have come from northwest India or Persia, about 1,000 years ago. By the 15th century they had migrated to Europe. By the end of the next century they had found their way into every country on the continent. Sometimes they were welcome, but more often they were persecuted. By the late 18th century they had formed their own loose form of government in the Americas. Usually called a clan, it is ruled by a king or queen. Gypsies also have their own judicial or court system, and speak a language called Romany. In many instances they choose to practice a traditional religion such as Roman Catholic or Eastern Orthodox. Qualities Gypsies cherish include mobility, isolation and a basic refusal to merge with a host culture. World War II dealt them a terrible blow. It is estimated that as many as 500,000 of them perished in Nazi gas chambers and concentration camps. At present, their numbers range from one million to five million. Each year thousands of Gypsies gather in southern France at Saintes-Maries-de-la-Mer. The earliest record of Gypsies in Newark dates to before the Civil War, when a small band led by James Trail was known to camp in the woods south of Murphy's Lane on the Lower Road from Bloomfield to Belleville. In those days this was a very isolated spot, considered 'quite suitable for the nomads.' During the warm months, Gypsy bands wandered the countryside. At one time, while in Tennessee, they came upon a gullible person named Ferris. They induced him to bury a 'pot of gold,' which was to be buried at an auspicious moment when the moon and stars favored increase. The theory being that leaving a certain length of time before the discovery gave them ample time to get out of the country. But Ferris dug up the magic pot, found it filled with lead and 'was sorely vexed.' But the Gypsies had not counted on the persistence of their victim, who managed to trail them to their winter lair. In the meantime, Ferris contacted Squire Sanford of Belleville, offering him a reward if he would capture the scoundrels and return his money to him. Sanford did this in short order and the offenders promptly came to terms with the offended Ferris, giving up all the property on Murphy's Lane in an effort to avoid any further incidents. Almost 90 years later, in 1945, another account of Newark's local Gypsy population appeared in the local press, resulting largely from problems arising during World War II. The Newark Sunday Call reported the Gypsy population had been sharply reduced from 66 families to just six, and that gas rationing had made a big difference in their customs. No longer was it easy to travel from circus, carnival or state fairs in the metro area. At the time, a great plea was being made for manpower and the call went out for every able-bodied man to support the war effort. The Gypsies' metal-working skills were in great demand. For the first time, the caravan was temporarily sidetracked for a new type of home: the inexpensive and often abandoned empty store front, which in its own way was reflective of movement or travel. As Gypsy men went to work in the war plants, women practiced the ancient art of palm reading. Men also worked as auto mechanics and at 'While-U-Wait' photographic stores. 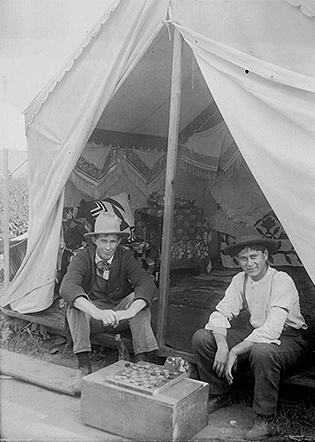 Gypsies, along with the rest of the community, tended to prosper in the war economy. In a rare newspaper interview in 1945, Rosie McGill, Russian-born resident of 131 Warren St., talked about her life in Newark with a Sunday Call reporter. She was married with four children. When asked why Gypsies would not leave the area, she responded, 'They have too many relatives and friends buried in local cemeteries. Gypsies have a great attachment to the dead.' Changing dress styles was just one of the many ways the war was altering the ways of the Gypsies she said, noting how her daughters no longer wore old-style clothes. One of them even attended the Warren Street School. A 1979 Star-Ledger article reported that Gypsy clans were continuing to seek isolation in New Jersey, continuing to reject the outside world. 'We have always been on the defensive,' said Newark's Frank Eli, king of the Gypsies, and descendant of Serbian and Russian tribal members whom he had led for more than 50 years. The account described the New Jersey Gypsy as little changed by the sexual revolution of the 1960s and mentioned the enduring policy of protecting young girls. Arranged marriages continued, women worked as fortune tellers, and men labored as roofers and mechanics. On the dark side was the claim of crime inside the community as occasional con artists preyed on the elderly. In 1992, an article in the New York Times again reconfirmed the community's desire to remain invisible in everyday society. Titled 'The Hidden Minority: New Jersey's Thousands of Gypsies,' it spoke of the Gypsies' fear of persecution and the continuing attempt to elude assimilation. At the time, it was estimated that there were 1 million Gypsies in the country. New Jersey's largest concentration was centered in Newark, Paterson and Elizabeth. The articles also mentioned charismatic churches in Paterson, Montclair and Orange and groupings of Gypsy families in Toms River and Atlantic City. Two of the most colorful social events that take place in the Gypsy world are weddings and funerals. In September 1949, The Star-Ledger reported the funeral of 76-year-old Newark Gypsy king Steve Stevanowich, who died after being struck by a speeding truck in New York. Four hundred vagabond subjects and 150 members of the Stevens' clan converged on Evergreen Cemetery dressed in native Yugoslav garb to say goodbye to a revered ruler. The funeral was conducted by Dean D. J. Shoukletovich of St. Nicholas Church in New York and Father Macarius of the Serbian St. Sava's Church in an Eastern Orthodox death ritual. Golden coins were tossed into the open grave, 'to help pay his way to St. Peter,' and wine was generously spilled over the gravesite in case of an after-death thirst. A young man was posted at the gravesite with a lighted candle while the coffin was lowered into the ground. When it was at the bottom, the candle was extinguished and thrown into the open grave. The burial of Newark's Gypsy queen, Mary Mitchel, took place in Linden with an estimated 25,000 attending from around the world. Her death vigil at St. Vincent's Hospital in New York City saw the takeover of the hospital board room by Slovak mourners. Hundreds of dollars were tossed into Mitchel's open grave to ensure a safe passage into the other world, and a four-piece band played 'When the Saints Go Marching In.' A $6,000 burial stone marked the site. The 1963 funeral of Joe Uwanawich, also a Newark Gypsy king, took place at Evergreen, accompanied by dancing and singing. Beer, wine and sandwiches were consumed at the burial site and left in memory and honor of the deceased. A $2,000 grave marker honored the site and simply read 'The King.' Two large angels were later added to the monument. An inventory of some of the more interesting Gypsy monuments in Evergreen Cemetery by Jean-Rae Turner in 1994 include the Lee family monument, which bears the inscription 'Among the Gypsies every man is a king and every woman a queen.' The bleeding heart of Jesus is a popular motif as well as a variety of angels. There is a section of Evergreen that is almost exclusively the domain of the Gypsies. Many of the markers tend to be located along the outside of the burial area. Prominent gypsy families include Evans, Stevens, Mills and Smith. A particularly impressive monument is the Miller site, with its back to Weequahic Park. The Uwanawich stone includes two hearts with a couple walking into the sunset. There is a very elegant black marble monument with tiny pink roses around it. Two large urns at either side of the stones were filled with red roses for years. Frequently, the family would come for a visit on Sunday afternoon or on holy days. Singing Sam's monument near the Lower Road and North Broad Street once had a recording of his own music. In addition, many of the markers bear laminated photographs of the deceased. Perhaps the most joyous occasions were Gypsy weddings. In 1940, the Newark News recorded a colorful rite between two 15-year-olds at Academy Hall at 103 Jackson St., where 200 brightly dressed and heavily ornamented people 'gaily celebrated the wedding of two young people.' The guest list ranged in age from a 102-year-old to children only a few months old. Six musicians provided music and dancers threw off their coats in the stifling summer heat. The bride was Sylvia Mitchell, daughter of Larry and Lena Mitchell of Hill Street, who wore a silver-threaded gown and shawl, a heart on a gold chain and a tiara with three roses. The groom was Walter Costello, son of Michael and Maria Costello, a pupil at Asbury Park High School. The family-arranged wedding, scheduled to begin at 1 p.m., was interrupted by inquisitive photographers and reporters who got in the way. The celebrations were scheduled to last until 6 p.m., 'when the crowd repaired to 406 Washington St. to continue celebrating and having a good time for another 24 hours.' Between 500 and 1,000 guests arrived to pay their respects to the married couple and their respective families. When the father of the bride was asked if this was a big wedding, he answered not particularly. His marriage in 1932 in Newark was celebrated for three days and nights. Although the young couple was now married they still were not allowed to dance together. One observer noted that while the dance had originated in ancient Egypt, a great deal of it reflected the contemporary jitterbug. If remaining hidden was the primary goal of Newark's Gypsy community, the members have been relatively successful. Apart from a dozen or more clippings in area newspapers about special or unusual events such as weddings or funerals, there is practically nothing else in print about them. Nor are there any entries in the more than a dozen histories of the city and county, save for a reference about the event at Murphy's Lane before the American Civil War. Hidden but not lost, they remain nomads in New Jersey. Gypsies may have become even more anonymous by the fact that they survive as individuals and not in groups. But try to find a real Gypsy! While researching the topic at the library, my table partner turned to me and said, 'Is that what you are here for? My mother is a Gypsy, but doesn't like to talk about it, and my grandparents still live in Scotland and are Gypsies, too.' The young artist who lives in a downtown loft went on to relate the story of her family alternatively living in Italy and Scotland for the past 500 years. Her own feelings are that travel and adventure are part of her own personality and in her blood. So you never know. Maybe you will get to know a Gypsy when you least expect it.